Many long years ago, I posted this story on my blog. It got slammed with views periodically, particularly from India. The search terms were variations on the title, which is “Personal Essay — My Mother.” I finally figured it was from people studying English, trying to rip off an assignment. I renamed the page “Not Your Homework,” and the views stopped. Surely, surely, nobody actually turned in an assignment saying, “My mother has snakes for hair,” which is what this “personal essay” is about. My father has regular hair and so do I. So do all of my grandmas and grandpas, so I don’t know where my mother got snakes. She says they’re just a gift from the gods, and I shouldn’t ask so many questions, or the gods might give me a gift, too. I said that didn’t sound so bad, and she said it depends on the god, and it depends on the gift. She has never had a haircut in her life, she says, but twice a year she goes to her sister, a herpetologist, to have them thinned. She says she won’t have to do that very much longer, because she says she’s getting older, and they’re getting thinner on their own. I know Daddy’s always complaining about them clogging up the drains, and sometimes we find one in the salad. My mother is a stay-at-home Mom. She says she likes it that way. She says she’s had enough adventures in her life. When I ask her to tell me some, she says, “Never mind–I don’t want to give you any ideas!” Then she winks at me, and her snakes all curl around her shoulders and open their mouths and bob their heads and laugh with their little red tongues. 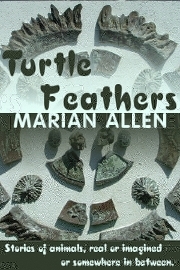 I’ve included this story in my collection, TURTLE FEATHERS, an insignificant 99 cents. A WRITING PROMPT FOR YOU: Imagine the family life of a “monster” from mythology. This entry was posted in Sample Sunday. Tagged mythology, short story excerpt. I LOVE this story !!!!! Thanks, Jane. 🙂 I enjoyed writing it. It came to me one morning, when I looked into the mirror. OMG. Honeypot for homework miscreants! Now I want to start a whole site devoted to the idea. Love this story! lol – what a fun story!